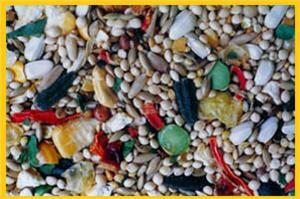 Make Parrots & Company Premium Cockatiel Blend your bird's primary source of nutrition. This is a hearty, high-quality blend that contains all of the natural protein, fiber, oils and nutrients of whole grains. Individual grains are air cleaned to produce a dust-free and tempting meal that is eagerly consumed by cockatiels. The variety of ingredients in Parrots & Company Premium Cockatiel Blend is what cockatiels search for and what provides the nutrition they require.